I am always looking for something sweet. Especially of a night horrible habit for me but I love sweets. 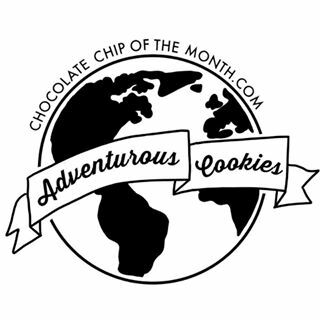 Chocolate Chip Of The Month Club is so amazing get a new variety of cookies every month with one subscription. Seasonal subscriptions start at $12 for a half dozen, $22 a dozen and $40 for two dozen. They also have the Baker's Choice Assortment prices are the same but the variety of cookies is different. The Baker's Choice is for the truly adventurous! They pick out a delicious assortment for you. Flavors may include something from their Classic Flavors, the Seasonal Collection, or maybe even a sample flavor they have been working on. Place your order here. We tried the Seasonal Assortment and received Pumpkin Spice, Smoky Chili Chocolate, Mint Chocolate Chip, and regular Chocolate Chip. These are the softest, moist, divine cookies you will taste! 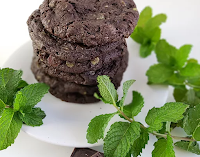 The mint chocolate chip has added mini mint chocolate chips to our double chocolate cookies for just the right balance of creamy mint and dark chocolate cookie. The Smoky Chili Chocolate cookie starts out with a hint of sweet cinnamon and smoky chili and ends with a mild kick of cayenne. The balance of spicy and sweet is addictive. The Pumpkin Spice cookie gets its warm, familiar aroma from traditional pumpkin pie spices like cinnamon, ginger, and cloves. 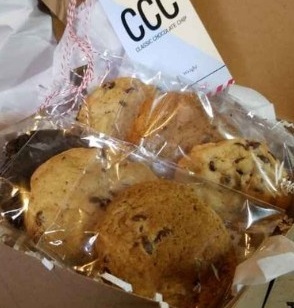 My kids favorite was the regular chocolate chip cookies. They were soft bake and moist as could be. My favorite was the Pumpkin Spice; the pumpkin was just the kick that the chocolate needed to be a seasonal hit. I love anything pumpkin anyway. My husband enjoyed the Smoky Chili Chocolate he is the most adventurous food wise and tried this one and loved it! 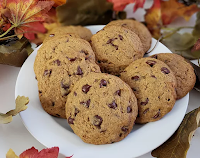 The Chocolate Chip of the Month Club makes the perfect inexpensive gift this holiday season for the foodie on your list. I would love to win for my hubby. He loves cookies and this would be a great treat for him. I would love to win this for my son and husband. They would enjoy. for my mom as a gift! I am the choco-haulic in our house! I love all of it! I want to win this for my sons and granddaughters. I would like to win for myself and my family. I'd love it to share with my family. I recently had a baby, and this would be awesome for myself and my 3 year old!